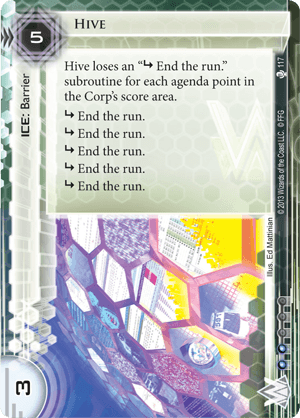 Hive loses an "subroutine End the run." subroutine for each agenda point in the Corp's score area. Hive is arguably the second best Weyland ice in the game, and is a strong include in nearly every Weyland deck. "But it's expennnnnsive!" "But it has a drawwwback!" No. No. Shut up. No. Hive is the best rush ice in the game. Little Engine can give it a run for its money (heh), but it's in the wr... (I'm sorry, can we just take a second to appreciate that double pun?) ...rong faction. Chimera is a neat little trick, but there's actually a lot of opening hands that can slap her down. ...Phrasing. Both of those plays are either incredibly stupid, incredibly lucky, or both. Inside Job is a "welp", but don't do this against criminals you idiot. More often than not, Green is the "rush" ID, and even if you aren't rushing, you're still probably relying heavily on powerful cards like Archer (she's clearly Hive's better half) and Corporate Town, both cards that require you to at least score one agenda before they can take hold. Scoring early in Weyland is a bit like scoring an early Astro in NBN - it truly sets the pace for the rest of the game. Nothing (besides fast-advance) lets you secure that first agenda quite like Hive does. 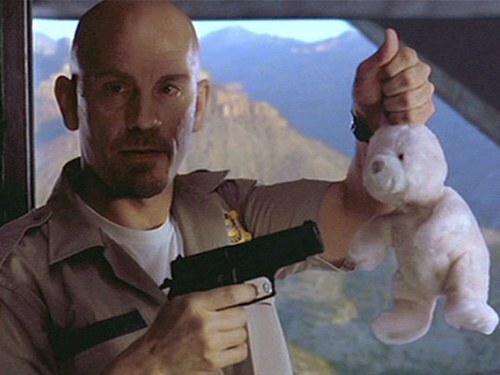 Let's address the elephant in the room, though. Hive is clearly designed to be overpowered in the early game, and then become crappy as the game goes on (it's kind of like the "bad pub" of ice). Luckily, Weyland is the faction best able to shovel that crap into the neighbor's yard. Finally, I'd just like to point out that even after scoring a 2-pointer, Hive is still as cost-efficient as a Spiderweb. If you score to 4 and then close out the game with a 3 pointer, Hive is doing work for you all game. • Faust is everywhere, and Faust HATES this card. It cannot get through this thing by itself without burning through 6 cards. If they're using e3 Feedback Implants to save cards, it'll still cost them 2 cards and $4 to get in. Even Atman has to pay $5 to punch through this thing when it's at full strength -- not too shabby! • Parasite is rarer in the post-MWL world, which helps mitigate the low strength. • If you're Blue Sun: Powering the Future, it can be easily recalled after it falls off late-game -- or just moved to another server to continue to stymie the efforts of a Faust-reliant runner. It's not the right call for every deck, but for decks that can't score quickly and/or would prefer to flatline the runner, it has become a lot more valuable lately. Give it a try!